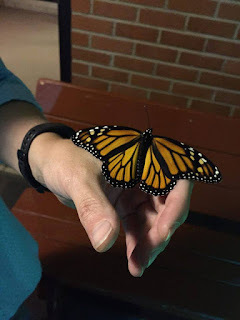 Recently one night I was walking out of work and a monarch swooped down on me & the other girl I was walking out with. Legend says butterflies are messengers from Heaven, that they are letting you know loved ones who have passed away haven't forgotten you. I don't know if it's true, but it's certainly a nice message to get. This photo is owned by me but not copyrighted because I didn't actually take the picture. I just wanted to post for you to enjoy.